This features allow you to launch Excel Visual Reports from Project Reader. It will be available until the Project Reader Evaluation edition is not expired. About the purchased licenses, the Visual Report feature will be working on the Project Reader Professional edition. The Visual Reports list window show you a row for each report. The list is read both locally on your computer and from a service on the projectreader.com website (if you are using a proxy server to connect to the Internet, you need to configure the proxy server settings). 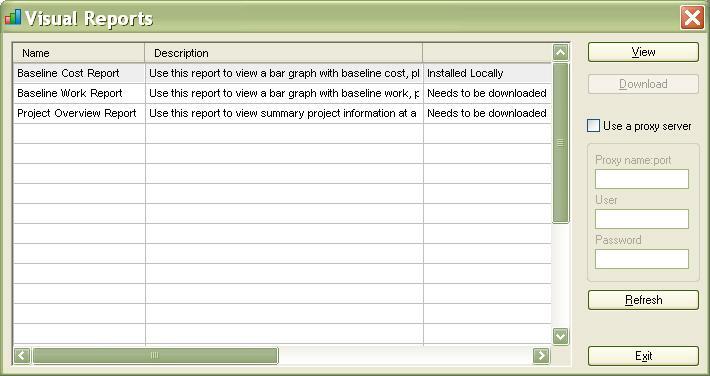 A Report can be launched only when it is installed locally by double click on the list or selecting it and by clicking on View button. The reports are available at the download page, in alternative you can download them from Visual Reports window of Project Reader.